For all my life I have observed this bizarre time warp that is North Korea who, for all that time, have gone on as if their war with the southern half of the peninsula (1950-1953) had never ended, which technically it still hasn’t. From 1876 until the end of WW2, the whole peninsula had been a Japanese ‘protectorate’ and post-1910, part of Japan itself. The late intervention of the Soviet Union in the War in the Pacific allowed their Far East armies to roll through much of China, Manchukuo and Korea before the Western Allies could do much about it. With Mao Tse Tung’s Communist victory in 1949, parallels to a divided Germany in Europe were divided Chinas, Vietnams and Koreas in the Far East, all of which became disparate aspects of the front line in the new Cold War. It has never been clear the extent to which Stalin encouraged its North Korean protégé to seize the rest of the country in 1950 but they came close before a nominally UN but actually mainly US force held on around Pusan then counterattacked. This swept South Korea clear of invaders but that wasn’t good enough for Macarthur, who tried to clear North Korea too. This brought in the Chinese PLA hordes, who took things back to the original start line. It also divided a culture even more severely than East/West Germany or North/South Vietnam, both since reunited and exhibiting much healing as a result. Whereas the South has blossomed as the developed and prosperous Republic of Korea, starting with heavy engineering and culminating in global electronic brands like Acer and LG, the People’s Republic is a homage to Stalinist belligerence from the 1930s—right down to the high-peaked Red Army caps worn by the PRNK military. Not only does North Korea’s state directed economy achieve a bare $20bn p.a. GDP from its 25m people but it spends 25% of it on defence. South Korea’s 50m people achieve a $1.1tn GDP but achieve comparable defence capabilities on its $27bn defence budget. 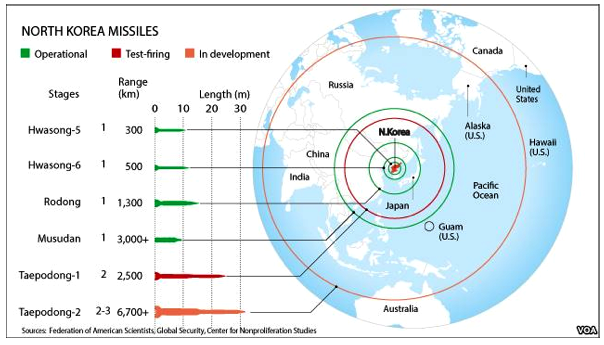 Where North Korea dominates is not in its technology but in its sheer size as the fifth largest armed forces on the planet, after the China, Russia, the USA and India. North Korea delights in Soviet-style parades of artillery and rockets through Pyongyang but what no-one is sure of is whether some of the rockets are anything more than some oil drums welded together. For so long, their generals have been whipping up a frenzy of paranoid militarism, based on supposed hatred from the rest of the world that decades of escalating rhetoric have left them painted into a diplomatic corner of either taking some form of military action or risking the political house of cards collapsing in humiliation. The effective King of Korea, 28-year-old KIm Jong Il took over from his father who had taken over from his grandfather in the bizarre concept of a communist dynasty of “Dear Leaders” but the true power lies with the military. There is little doubt that if they could nuke American, they would. But every attempt they have made so far to build a true ICBM that could reach even Hawaii has failed. No-one questions that they have rockets capable of reaching that far; whether they are advanced enough to squeeze a heavy and complex nuclear warhead is the question. If a shooting war starts—and the chances of this rather than a nuclear strike seem higher—it would result in a bloody land war, probably reminiscent of 1950-53 in its to-ing and fro-ing. South Korea should hold the North’s masses with American help for the same reason that ‘shock and awe’ did for the much larger Iraqi forces in the 2nd Gulf War. PRNK forces are many but generally equipped with obsolete weapons and almost no chance of gaining air superiority, on which conventional 21st century warfare pivots. It’s hard to see how the PRNK generals would not be smart enough to see that, massive though their forces are, they would start at a tactical disadvantage, lose the war and be collectively out of a job in the smoking ruins of an even poorer country. But such are the self-reinforcing delusions of a closed society that many come to believe their own rhetoric. And, if it were all to go to Hell in a handcart, their Leader could indeed turn out to be a very Dear one for the impoverished 25m, virtually all of whom have endured starvation levels of poverty to sustain his family’s paranoia all their lives. Pyongyang’s order of battle is equivalent to approximately 150 active duty brigades. That includes 27 infantry divisions, as well as some 15 independent armoured brigades, 14 infantry brigades, and 21 artillery brigades. North Korean forces are heavily dug-in with more than 4,000 underground facilities and bunkers near the DMZ and an estimated 20 tunnels dug under the DMZ, of which four have been found. There are also more than 20 Special Forces brigades, totaling about 88,000 troops, which could be deployed by air, sea and land to disrupt US and South Korean combat operations and attack civilian targets. North Korea’s armoured forces are estimated to include some 3,500 main battle tanks (MBTs), 3,000 armoured personnel carriers and light tanks, and more than 10,000 heavy-calibre artillery pieces, many of which are self-propelled. The MBT force primarily comprises older T-54/55/59 models, but includes some 800 indigenously produced T-62s. Of the estimated 10,000 or so artillery pieces in the North Korean inventory, a considerable number are pre-deployed, in range of Seoul; additional artillery could be moved forward to fortified firing positions at short notice. 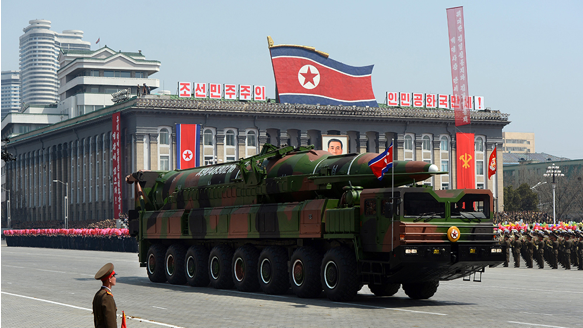 Of particular concern to Seoul are Pyongyang’s 240mm multiple rocket launchers (capable of simultaneously firing 16–18 rockets), its 152mm and 170mm towed and self-propelled artillery pieces, and its mobile FROG systems – all of which are capable of delivering chemical and biological agents as well as conventional high-explosives. In addition, the ground forces have about 7,500 mortars, several hundred surface-to-surface missiles, 11,000 air defence guns, 10,000 surface-to-air missiles, and numerous anti-tank guided weapons. The North Korean air force possess some 605 combat aircraft and is organised into 33 regiments: 11 fighter/ ground attack; two bomber; seven helicopter; seven transport; and six training regiments. The air force mostly comprises older MiG aircraft (of the MiG-15/17/19/21 types), but includes small numbers of more modern MiG-23, MiG-29 and Su-25 aircraft. Like North Korea’s ground forces, a relatively large percentage of the air force is deployed near the DMZ – at military air bases only minutes flying time from Seoul. The North Korean navy can be divided into six main groups: 43 missile craft; about 100 torpedo craft; 158 patrol craft (of which 133 are inshore vessels); about 26 diesel submarines of Soviet design; 10 amphibious ships; and 23 mine countermeasures ships. There are also some 65 miniature submarines for the insertion and extraction of Special Forces. Around 60 percent of the North Korean navy is deployed in forward bases, and North Korea has strengthened its coastal defences in forward areas by deploying more modern anti-ship cruise missiles. It is estimated that North Korea’s heavy armoured forces, possessing enough combat hardware to equip perhaps ten US divisions, have an actual capability equivalent to about 2.5 US armoured divisions. With equipment operated by the infantry added, the North Korean ground forces possess an overall firepower which is equivalent to nearly five modern US heavy divisions. By comparison, Iraq was assessed as having six modern division equivalents and North Korean airpower, the equivalent to six US wing equivalents in size, corresponds to only two F-16 wing equivalents in estimated net capability. This entry was posted in Politics and tagged North Korea; Cold War; military capability. Bookmark the permalink. I see my old home town of Townsville is just in range of the missles – if they work. If I were the North Koreans and intent on an actual nuclear attack I think my launch vehicle of choice would be an old trawler with a few “volunteers” on it.